UPDATE: I hope you enjoy this Christmas tour of our previous home. We’ve moved into a new-to-us house that we’re completely remodeling. Click HERE to take a look at how I’ve reinvented my style! Almost all of the Christmas decorations in my home this year were put together using items that I already had. I changed things up a bit to give it all a different look – some slightly different and some drastically different from last year. My front porch is one of the places that looks drastically different. This year, I opted to use more natural elements. I still love all the glitter, but you won’t find any on my porch this year. 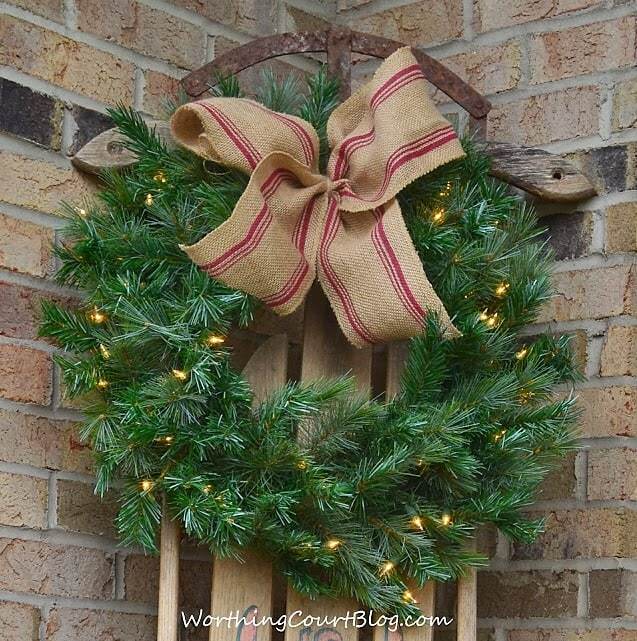 I brought back my sled and ice skates from last year’s winter porch, but added a lighted wreath (picked up on clearance after Christmas last year) and added a burlap bow to it. Simple. 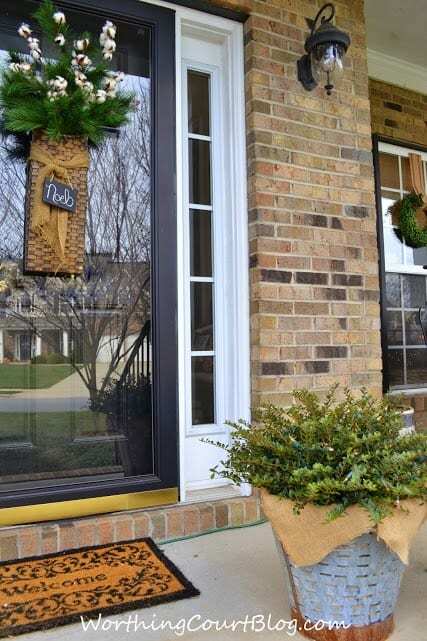 The basket from my fall home tour remained on the front door. I filled it with cotton stems and greenery for Christmas. 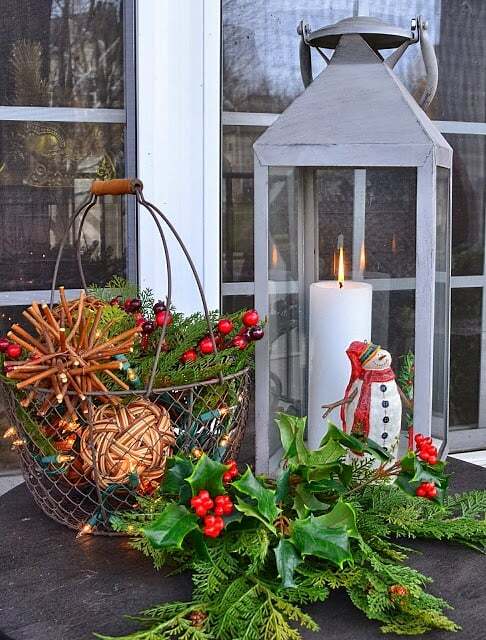 I brought my olive bucket from the hearth out to the porch and added a pretty little shrub and some lights to it. The other end of the porch is a real bear to photograph. Not only is it long and narrow, but the railing makes it pretty impossible to photograph from the front. And wouldn’t you know, that I didn’t notice the crooked ribbon on the pillow until it was too late. Oops. I’m kind of in love with the vignette on the table between the chairs. I’m also kind of in love with the $1 spot in Target where I found the cutey-patootey burlap snowflake pillow. 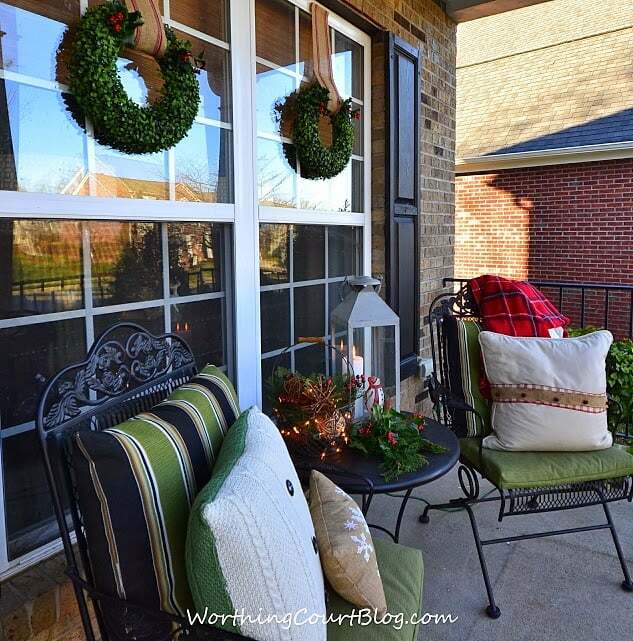 Click HERE to see my front porch decorated for Christmas last year. Totally different. The decorations in my foyer are very simple. 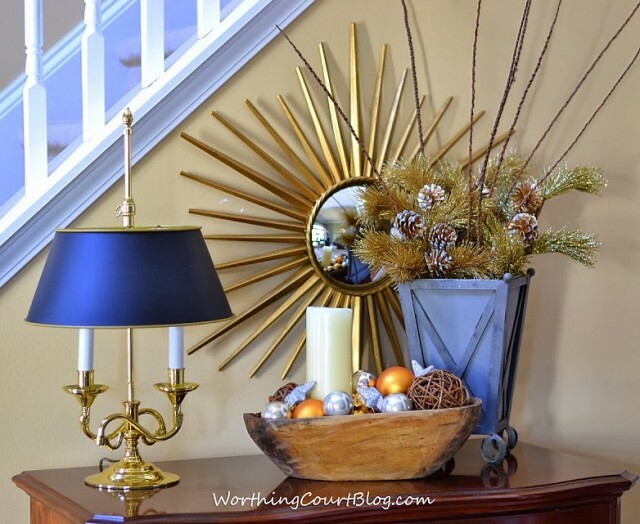 Even though there isn’t any glitter on the front porch, I knew there would be in other areas of the house so I started introducing a bit of it by mixing rustic and refined elements in my dough bowl and in one of the zinc planters from my fall mantel. 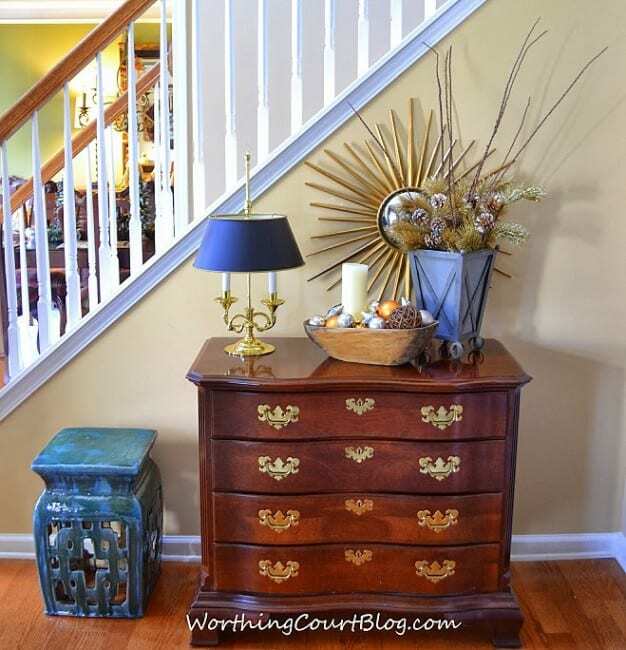 The dining room is located right off of the my foyer and this is where I pulled together elements that I already had to create a Pottery Barn inspired centerpiece. More simplicity. 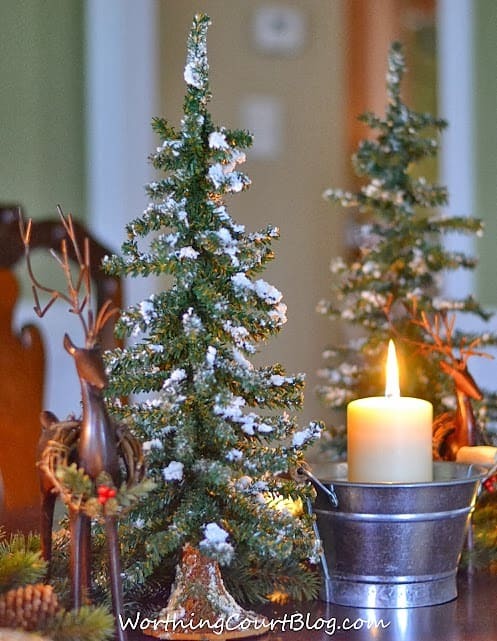 Mini flocked trees, rustic metal deer, vintage snowball candles, mini candles and candles in tin buckets are intermingled among a pine garland that I snaked along the table. 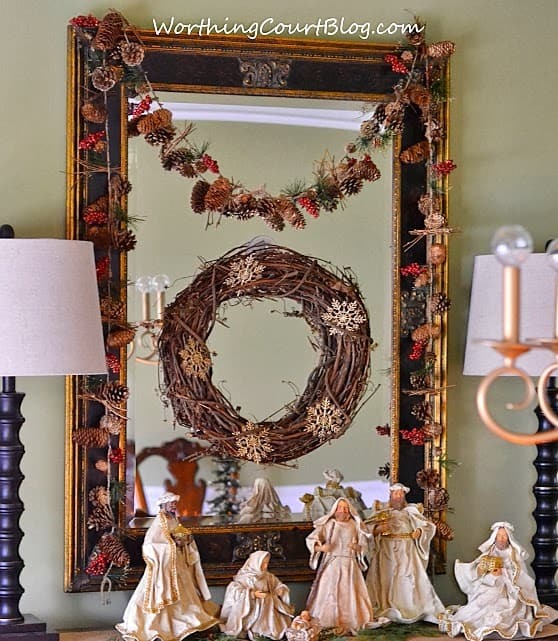 The nativity scene is located on the sideboard again this year, but I changed it up a bit by adding a rustic garland and wreath with some glittered pinecones and snowflakes to the mirror. 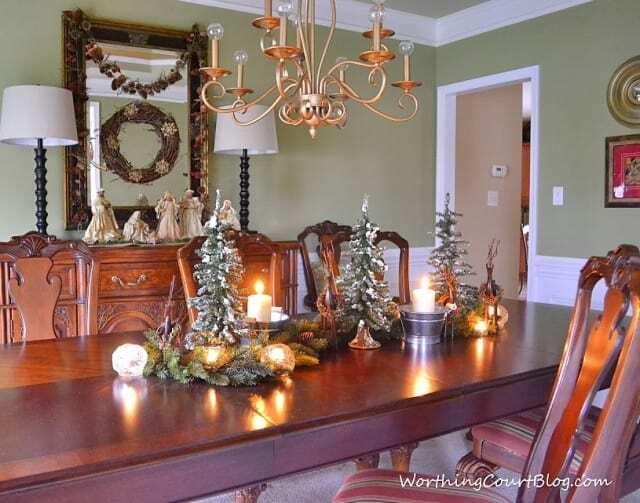 Click HERE to see my Christmas dining room last year. The front of my house is a little bit of natural, a little bit of rustic and a little bit of glitter all mixed together. But I like to keep things more on the fun side in the back of the house where my family room and kitchen are located. Nothing pleases me more than to see the twinkle in the eyes of my grands as they take in the sparkly and fun Christmas tree. I wouldn’t trade that for anything. I guess Princess Zoey was ashamed that we don’t have any gifts under the tree yet, so she left one of her squeaky toys for us to play with. The snowman head is actually meant to be a tree topper, but I think he’s perfect on the mantel with some puffy faux snow tucked into the lighted garland. 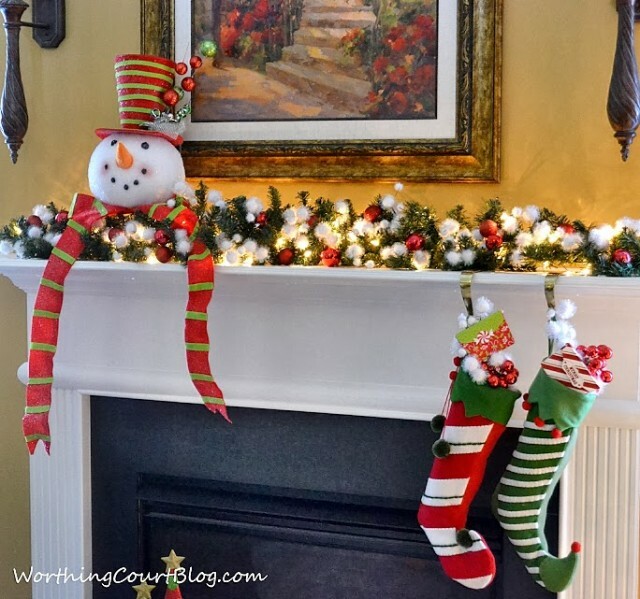 Click HERE to see my Christmas tree and HERE to see my mantel from last year. The island in my kitchen contains a kitchen tree that I started collecting ornaments for last year. I changed it up a bit from last year by placing it on a wicker tray and by wrapping the base with a Christmas napkin. My reproduction vintage toolbox got all Christmasfied with the addition of a favorite plate and Christmas cookbook. 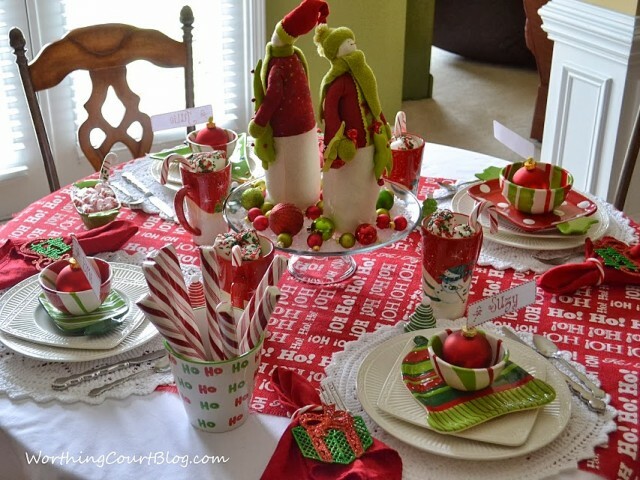 And lastly is a fun Christmas tablescape on my breakfast table. 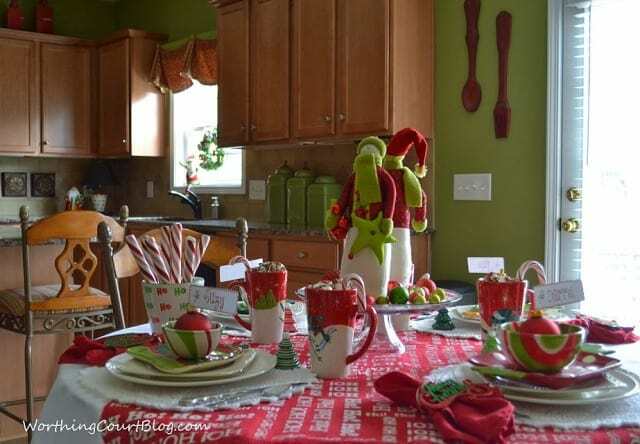 The red HoHoHo burlap that I ran across works perfectly with all of the Christmas dishes that I’ve collected over time. I wish I had bought more of it! The snowmen usually reside on the windowsill in my kitchen. 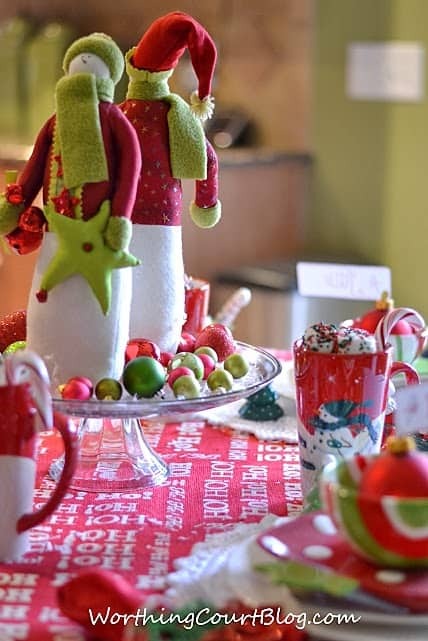 But placed on a glass cake stand with some ornaments and faux snow, they make a great centerpiece for the table. 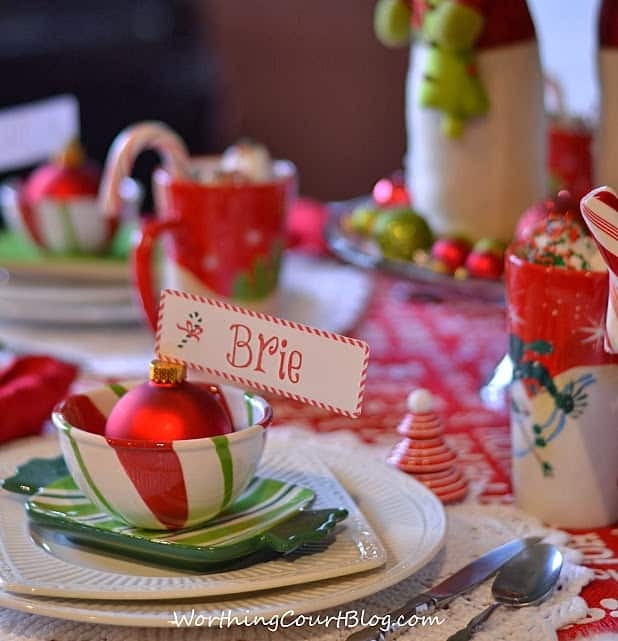 The snowflake placemats that my mom made, dishes that I’ve been collecting and candy canes all work together to create a fun and whimsical table. Thank you for coming to visit my Christmas house! 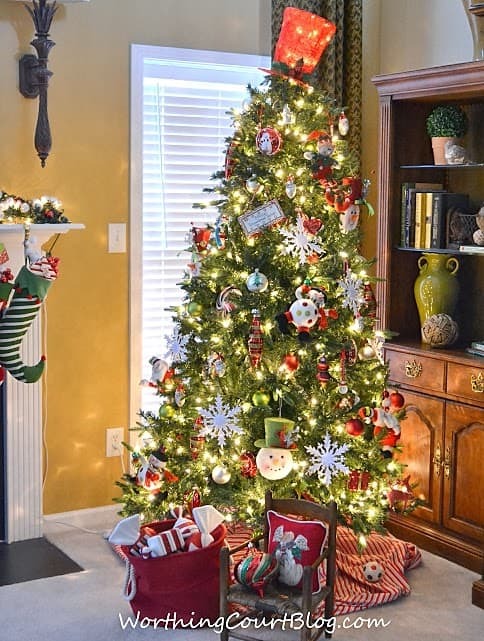 Want to know how to decorate your Christmas tree exactly like the pros do? 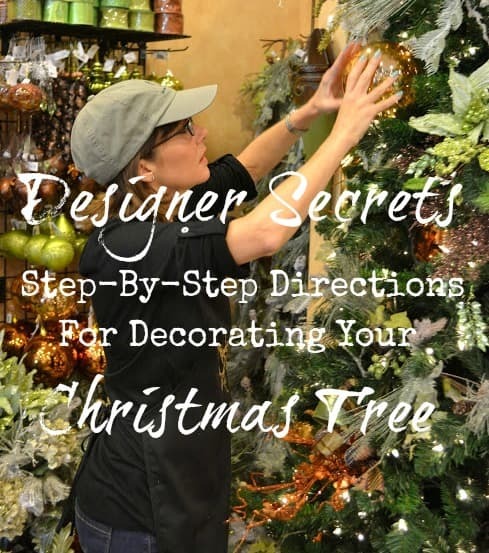 Click HERE to get step-by-step Christmas Tree Decorating Directions where professional Christmas designers spill all of their secrets, no matter what style of decor you like. 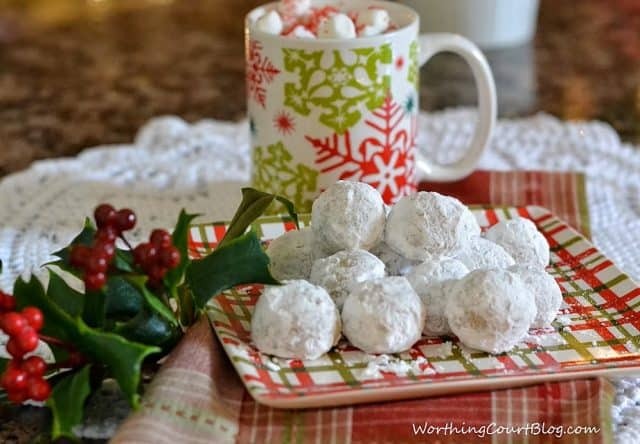 How about some Christmas cookies to keep your tummy happy while you’re decorating? 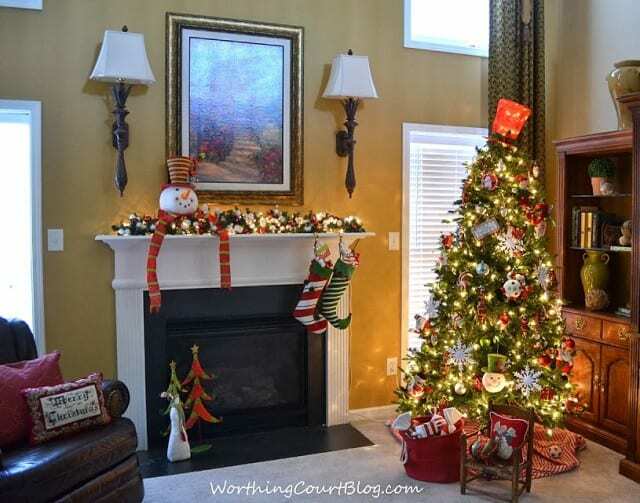 It is definitely looking like Christmas in your home, Suzy. I love it all! Suzy, your Christmas home is stunning! 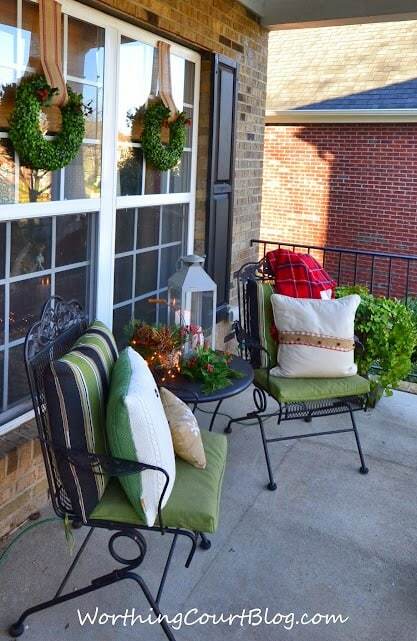 I LOVE all of the holiday colors … inviting front porch …. 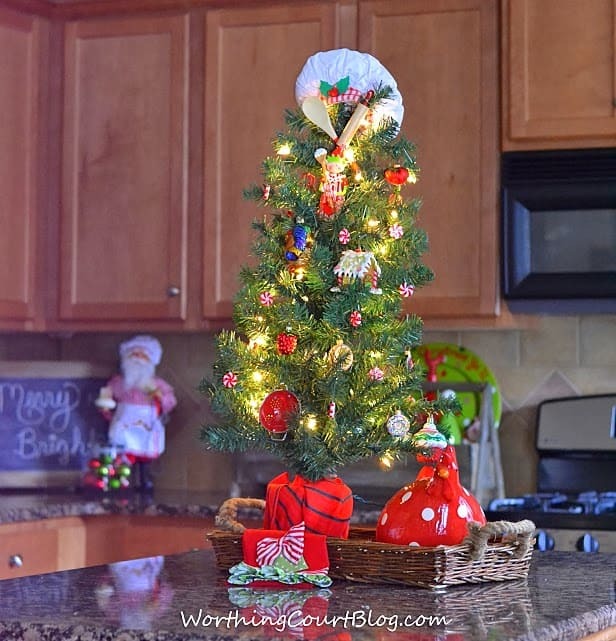 beautiful nativity in your dining room … whimsical and colorful tree in your great room (Princess Zoe’s idea was great) … and fun Christmas kitchen! Your tables cape is fabulous! Can’t wait to get closer looks! It all looks absolutely wonderful, Suzy! If you had not said anything, I would not have noticed the crooked ribbon;-). Just beautiful, Suzy! Love all your touches and it all looks so festive. I had the same thoughts this year…simplify and use what I already have. Love being on this tour with you! Your home is so festive! Love that pine cone garland on the mirror! Suzy- Happy Holidays! You have created such a warm and festive home for the holidays. Can I tell you, I would love to be sitting at that fun kitchen table having coffee right now! Simply has been my motto the past two yrs. vintage, recycle are good in my vocabulary. Love the little things that make a change. 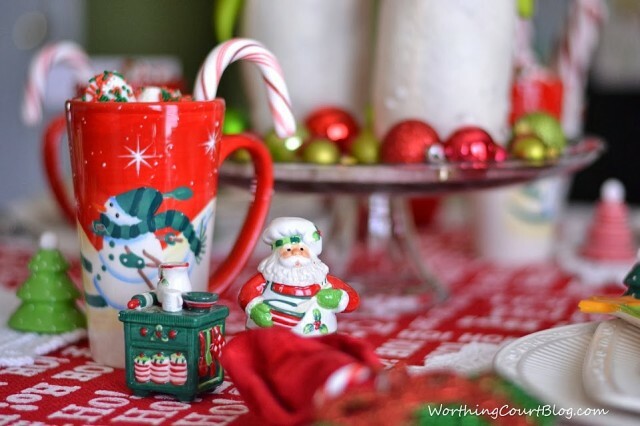 The skates, little bulbs in the mugs…. Soo pretty Suzy!!! Adore your pinecone garland and sweet table setting. Happy to be joining you for the tour!! Everything looks so pretty and festive Suzy…I’m a red girl too!! This is simply gorgeous. Every detail. I’m studying all the photos. I think the porch is my favorite – the sled is too cute and the whole area is so cozy. Suzy you outdid yourself everything is so cheery and festive, I am in love with the centerpiece down your dining table. I had to pin that! The little buckets add just the right texture to your arrangement. Merry Christmas! Suzy, your house is fabulous! I can’t pick a favorite space, but I love how each reflects your personality and the things you love. Like those grands. And I’m happy that you’re simplifying this year because that meant I got to borrow some fabulous pieces from you! I love the porch especially, and the colors on the table. It works together so well! Hope you have a lovely holiday season! First let me say Thank You for sharing your home with us. It’s beautiful. 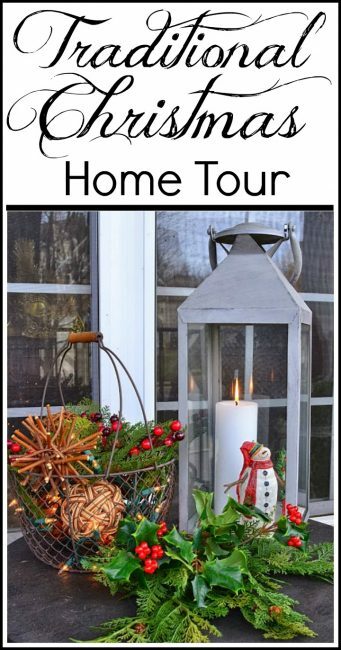 Now let me confess that I love love love Christmas Home Tours! Seriously I love them, mostly because I love Christmas, the decorations, the smells, the cheer, and the joy associated with the season. So I really enjoy being able to look at other peoples houses and get ideas for next years decorations. That being said, please allow me to go through the long list of things I loved on your Christmas Home Tour. – The wreaths on the outside of the windows. OK I’m kind of a wreath girl, and really love the look of them in windows, but I’m curious as to how you attached them. I have vinyl windows and try hard not to put holes in the casting (is that what it’s called? ) but I really really love the crisp edge on the the ribbon hanging the wreaths, please tell me how you got them up there if you didn’t use nails or a staple gun, as I would really love to do something like this next year. – The crooked ribbon on the pillow. I actually really love it, if you hadn’t mentioned that it wasn’t supposed to be crooked I would have thought that was they way it was meant to be. Really like it. – The top hat on the tree. Hello!!! Can we say LOVE. OK so my appreciation of this could stem from the fact that I grew up with a boring Angle on the top of our Christmas tree (that looked like everyone else’s Christmas tree) that I never really liked, so I absolutely love it when people go with something a little less traditional. – The Snowman Head on the mantel. I love how you did your mantel, it really looks great, and I can understand why your grand kids would love that area. – The Snowflake Placemats. I seriously love those, which is interesting to me as I’m not a doily kind of person, but use them as placemats and I’m suddenly all over it. Over all, I really love the tour and I’m looking forward to checking out the others. Hi Ricki. I’m so glad that you enjoyed the tour! My windows are vinyl too, so staples, etc. were a no-no. To get the crisp edge at the top of the ribbon, I folded it over toward the back and then hot-glued it in place. Then I used 3M Command velcro hanging strips to attach them to the windows. Hope this helps! Thanks so much for sharing! Your home is beautiful. Suzy, your home truly looks amazing. I love everything. 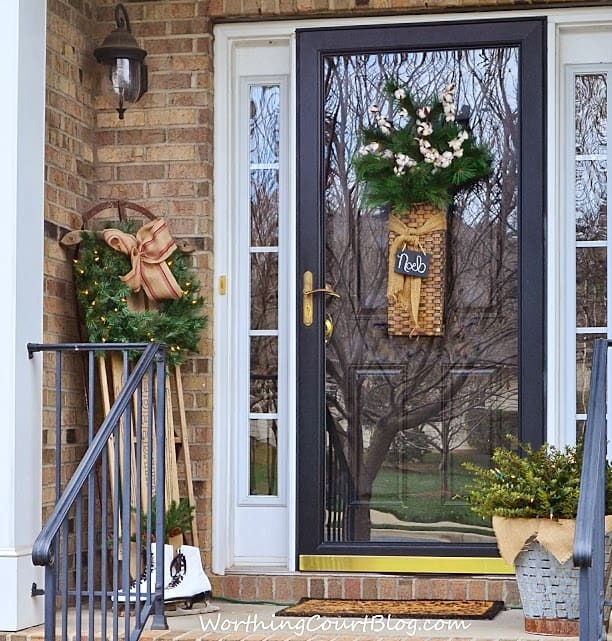 What you did on the front porch is gorgeous, love the touch of burlap and next year I am getting myself a pair of skates to decorate with for sure. 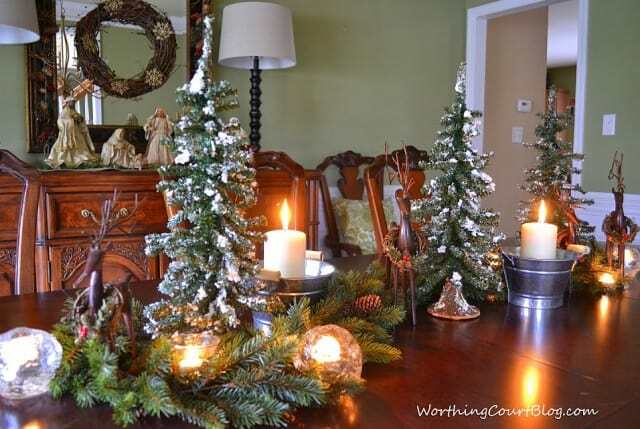 Love the trees on the dining room table too. Gorgeous, girl!! Suzy! Your home looks beautiful! You did a fantastic job I LOVE that table set up so inviting!! 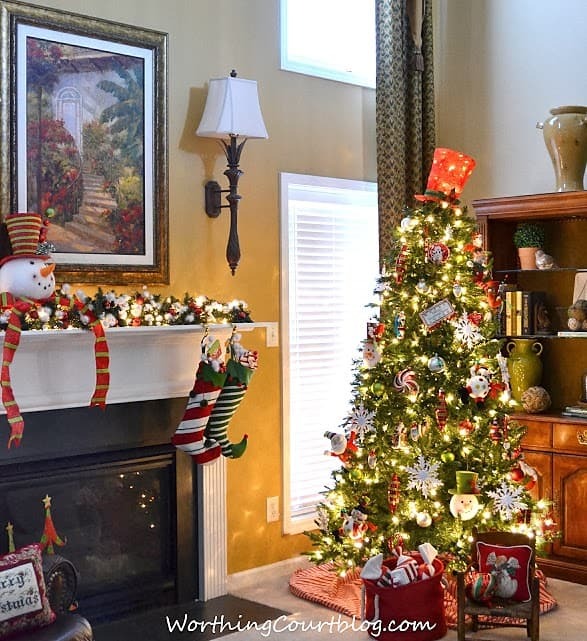 Your home looks absolutely ready for the holidays. Everything is lovely. I like how you mix the natural with the traditional green and red decorations. Happy Holidays! Looks wonderful! 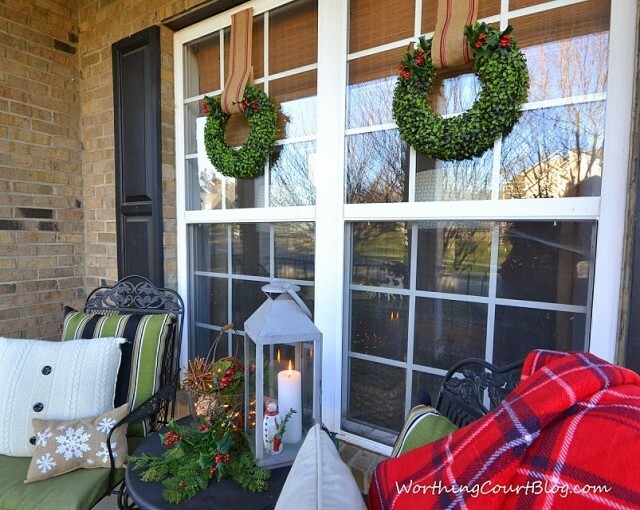 Tell me about the wreaths on the outdoor windows? Love them! Hi Laura. What would you like to know about the wreaths? Where can I find the HO HO Burlap? Love it! Hi Nan. I found the HoHoHo burlap at JoAnn’s fabric store a few weeks ago. Are the Santa’s that you’re asking about the ones on the kitchen table? If so, they’re a set of Fitz & Floyd salt and pepper shakers. Suzy what a beautiful Christmas tour! 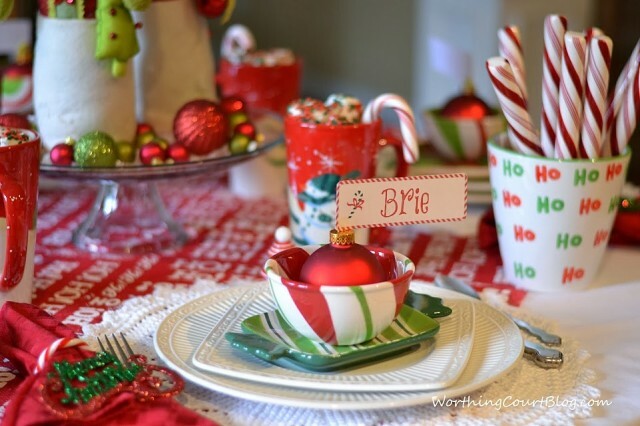 My favorite is your whimsical Christmas setup on your breakfast table…. Pinned! Your home looks absolutely stunning, Suzy! I love the cheerful colors! Happy Holidays! 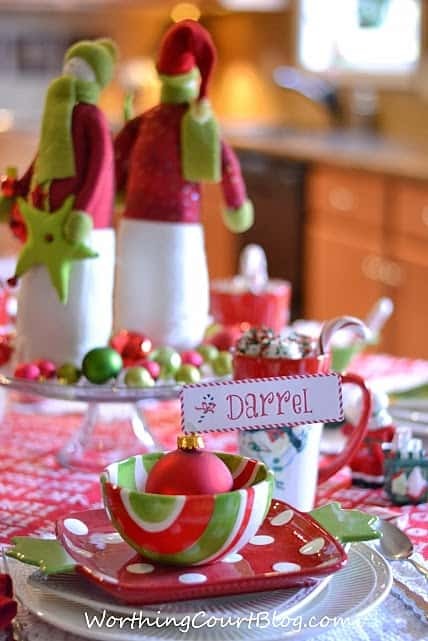 Love everything GF, especially the Ho Ho Ho fabric, place setting name tags and the holly you added to your boxwood wreaths. Since you are finished decorating, how bout coming over and helping me finish mine LOL! looks so festive and fun!! 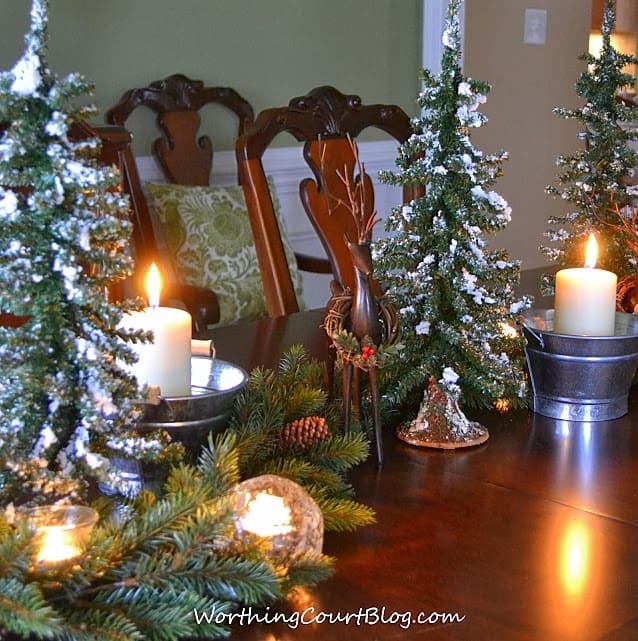 i love the dining table trees so much! Hi Suzy, I thought that ribbon was supposed to be wavy on your pillow! LOL! Love it all but my favorite has to be your tablesetting on your breakfast table. That HOHOHO fabric really makes it look so festive. If I ever see some of it, I will grab some! I love your decorations. I just bought some of the burlap ribbon with the red stripe-I think I am going to use it on brown paper wrapped packages. Your house is lovely and your decorations are beautiful! 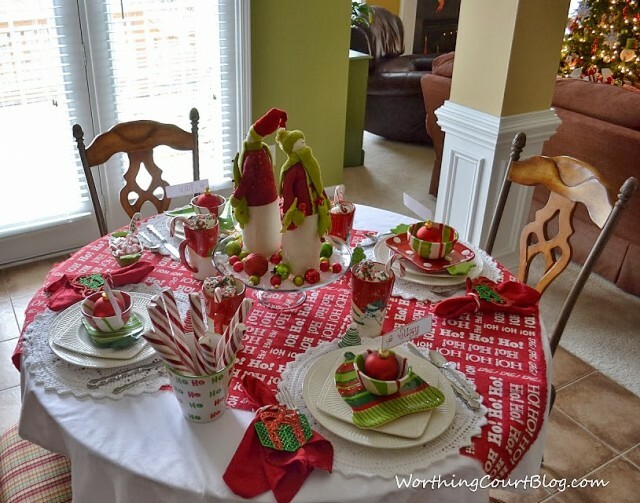 Everything looks wonderful Suzy – love the snowmen and your brilliant tablescape! Beautiful – love the tree topper – Princess Zoey has very good taste! Hi Suzy, just love your tree topper and both of your tables have inspired me. Thanks for the giveaway too. 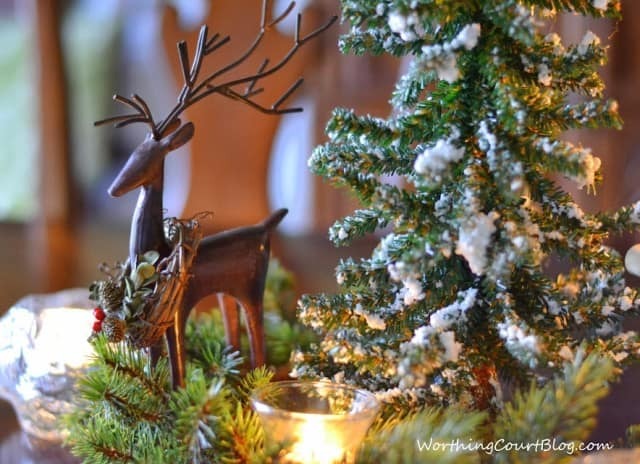 Beautiful Christmas decor! love it gives me great Ideas. Thanks for the givaway. Your home is lovely and so pretty decorated for Christmas. Thanks for sharing a tour. 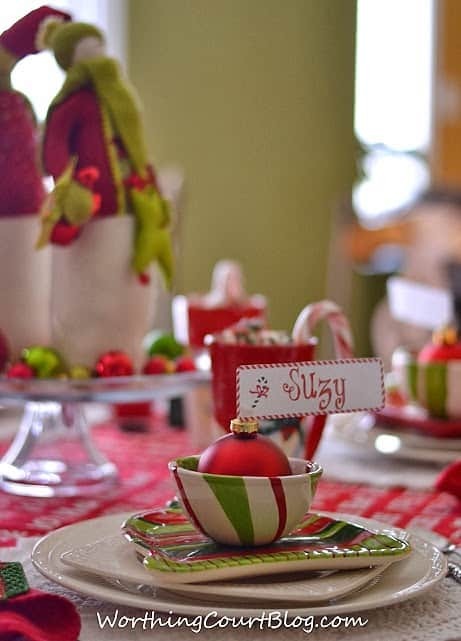 Everything looks so cute Suzy, I especially love your breakfast table! Your home looks beautiful! I love all the color! Oh my, I’m so inspired! Thank you for sharing your homes!! Suzy – your home is lovely! Thanks so much for all the work you put into this tour! It’s been so much fun seeing everyone’s homes all ready for Christmas! I am FINALLY getting by to leave a comment! Sorry I’m so late! I love your sled to pieces, to start things off! I love all the details and the way you bring things that are different together and make them all somehow work. I love the pinecone/rustic garland and would totally steal that idea if I had time! (So I’ll just pin it instead!) My most favorite is your tablescape and the place cards. Cheerful, fun, delightful and perfect come to mind. Great job, my friend! Suzy I love how you decorated your house! I love that you chose to make your family room more whimsical! Who says the back has to match the front? With that said it really isn’t “clashy” either. 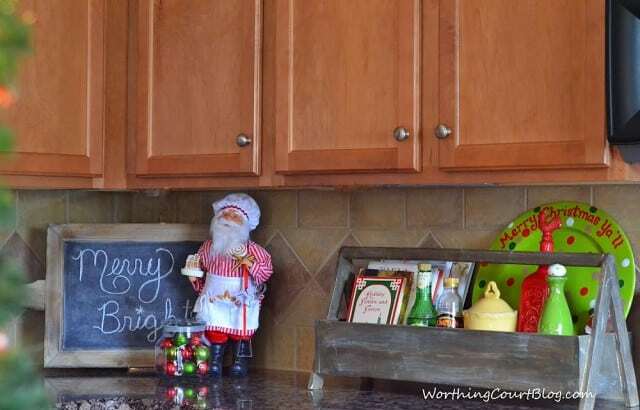 Where did you find the wonderful ho ho ho red burlap ? where did you find that wire basket on your front porch? It’s wonderful! correct this issue. If you have any suggestions, please share.Cheers! Beautiful! Love the rustic with elegance in your dining room. Merry Christmas!